Come experience Nashville the escape game way and see if you have what it takes to be a rockstar! Located in Downtown Nashville, The Escape Game offers an escape from ordinary life and allows you to live the stories you love. Here’s how it works: You and your team are locked in a room and have one hour to complete a mission and escape. Escaping will require teamwork, quick thinking, determination and a sense of urgency! In our Nashville game, this could be your big break! Search the studio and find the record contract destined to make you a star. You only have 60 minutes, Can you escape? Located at 162 3rd Avenue North in Downtown Nashville, please check in 15-minutes prior to your game start time. 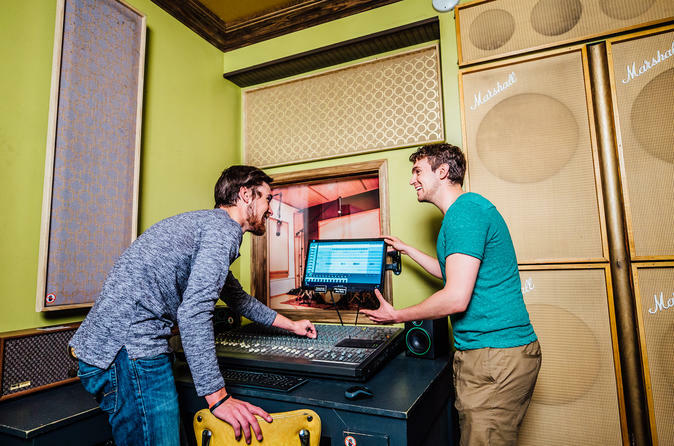 Our Nashville Escape Room is an exciting, immersive game perfect for Music City. You and your team are an up-and-coming band who want to make it big in the music industry. Recently, you heard a rumor that world renowned producer Rick Teggen hid a contract in his studio before he retired. Legend has it that if you’re the band that finds the contract, he will come back to produce one last record, guaranteed to make you famous. You’re a guest in the studio, so you only have 60 minutes…Good Luck!